Still in the mind set for big days it was Jeff’s turn to pick our objective. Lots of fresh snowfall meant that whilst we had plenty of options none of them were great- it landed upon Jeff’s encyclopaedic knowledge of the range to find us something. Disengage brain Griffith; Jeff’s in charge. 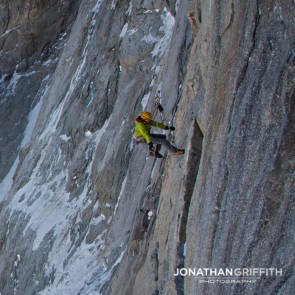 The traverse of the Chamonix Aiguilles is definitely a classic, but as usual with Jeff you have to make it interesting. 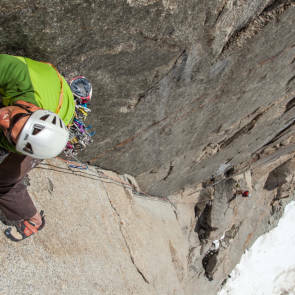 Doing it in reverse and in the ‘integral’- choosing the more spicy climbing version from the Republique- seemed a good way of making it ‘interesting’; and of course to keep me happy we’d be doing it in just two days…and from the first lift. An excellent idea all round really; now we just had to do it. First lift at the Montenvers saw myself, Jeff, and Fred en route for a distant peak over some just as equally huge and distant mountains- it was going to be a long day especially as we were carrying bivy kit. Nevertheless a fast approach took us up to the base where we psyched up, racked up and fired on up. Easy simul climbing ground took us to the breche between the Republique and the Charmoz. By now the weather had turned on us, yet again. It seems every time I head out with Jeff the weather gods conspire against us. This happened to coincide with us hitting the snow line so apart from enjoying the delights of route finding in a white out it meant easy grade 4 scrambling turned into a rather more mixed and wet affair. Nevertheless Fred took us up through pitch after pitch of wet and snowy ground, and enjoying the grand views that a full white out offers we arrived at the summit of the Charmoz. Excellent. Now we just needed to traverse to the Grepon, descend it, and head over to the Blatiere…all in all we could have done with an earlier start. 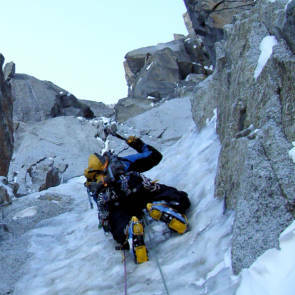 The traverse over to the Grepon is no push over especially when parts of it are dripping wet. The weather was now getting almost alpine in its nature (shock horror) and a most enjoyable brisk wind had picked up. We’d occasionally find ourlseves in the sun for a few minutes but mainly it was a nasty fight with freezing fingers, wet rock, snowy ledges, and a biting wind. More winter than summer- a few degrees colder and it might have been fun with axes and crampons! Jeff took over for some steep crack shenanigans and we kept traversing and traversing until finally the Grepon summit was just over our heads. A quick human ladder for the final bouldery move to the top and the climbing was all over. The clouds had lifted, the wind was still blowing, but at least we got the killer view from the summit. Jeff feeling the cold, but at least we got the view back! On the raps down sunset hit and since we had bivy kit we decided to call it a day and settle in while we still had some sun light left. Good news for me as the photos were stunning. The rest of the route looked really snowy from our stance and given the poor conditions we had encountered we decided to call it a day and descend the following morning. An awesome little adventure covering 1730m of ascent; thanks to Jeff and Fred. 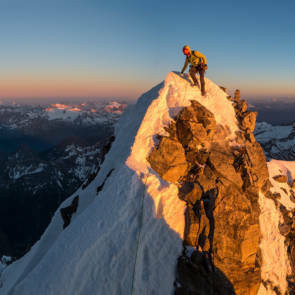 One of my new favourite shots- sunset as we found our bivy ledges with the Blatiere and Mont Blanc in the far distance.